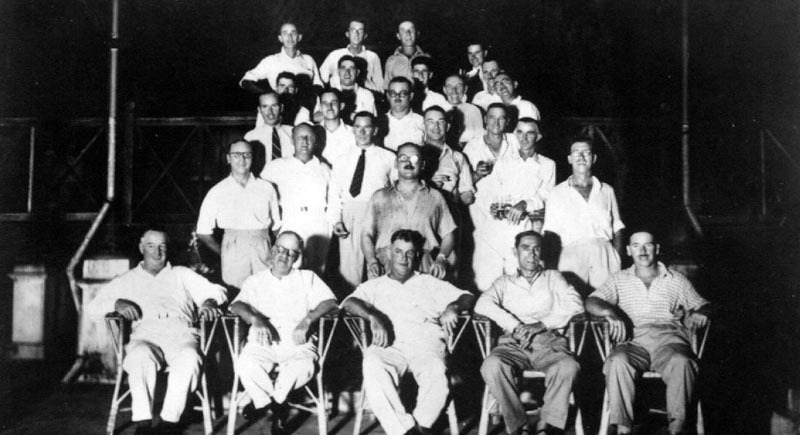 Farang members of The Miners Club in Phuket Town c1939. The Tong Ho was leased to Phuket’s farangs so they could escape to Singapore in 1942. 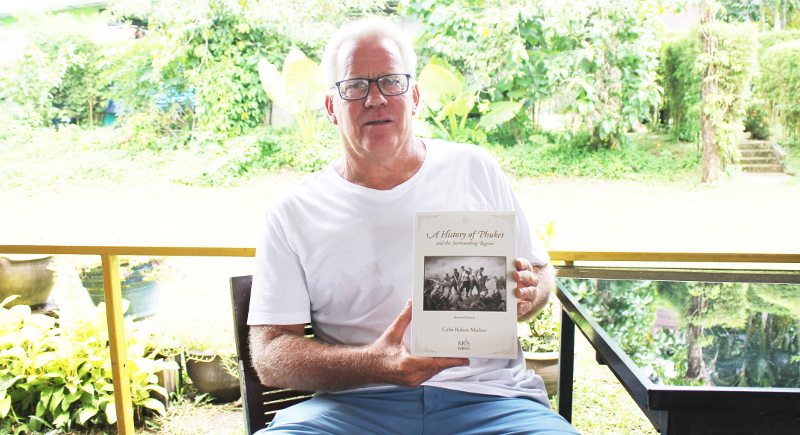 Author and long-time Phuket resident Colin Mackay has updated his book with new information, some from first-hand sources which were provided by readers of the first edition. Mr Mackay been invited to launch the second edition with a lecture at the Siam Society – the King’s Library – in Bangkok on November 10. “The first edition was very wellreceived both locally and internationally and is now available in many of the world’s most significant libraries,” said Mr Mackay. “I’m proud to have at last let Phuket’s long, colourful, yet previously little-known history out of its box. The new 472-page soft-cover second edition contains several updated and new sections. Mr Mackay spoke to The Phuket Newsabout some of the fascinating new information he has included in the new edition. “For example, when I was researching the Japanese invasion of Thailand in 1942, despite much investigation, I was previously unable to confirm exactly how the farangs (foreigners) on Phuket at the time had managed to escape from the island. “It was well documented that the Allied military command in Singapore ordered a Major Warren Parsons, the Australian manager of Tonkah Harbour Mining Company in Phuket, then the largest on the island, to arm, coordinate and lead the evacuation of Allied personnel from Phuket. “We knew that these 250 or so armed farangs and their families gathered at and defended the Phuket airfield waiting – as prearranged – for planes from Malaya to airlift them out. This is where conflicting versions of their escape arose. Luckily a relative of Major Parsons in Melbourne, who read the first edition of the book, kindly contacted Mr Mackay and sent him a copy of Major Parson’s actual warti me diary. “The facts of this daring escape of Phuket’s farangs from behind Japanese lines is a fascinating new story that I have added to the second edition,” he said. Mr Mackay has also expanded the section covering Phuket’s warring Chinese triads, who ruthlessly fought for dominance of the islands economy in the 1870s. “When writing the first edition I was unaware of a great massacre that occurred in Phuket in 1879. Then one Chinese scholar in Malaysia who read my book contacted me and introduced me to some new research she has been doing on this period. “At that time the island was a lawless place and two main Chinese triads effectively ran the island – the Gee Hin from Kathu and the Kien Teck from Phuket Town. “Both triads had well over 1,000 armed fighters who fought for control of Phuket’s lucrative tin mines, tin smelting, bird’s nest harvest, tax and opium farms. “In 1879 the Kien Teck leaders invited the main Gee Hin leaders for a so called ‘peace conference’ in a big a wooden house near the market in Phuket Town. After drinking with the Gee Hin leaders, the Kien Teck leaders slipped out and their fighters quickly locked the doors, set fire to the building and threw in explosives. “Anyone who escaped was hacked to death. When the Gee Hin fighters came to try to rescue their brothers, huge vicious street battles raged all night through Phuket Town,” Mr Mackay noted. “In the morning hundreds of mutilated corpses littered the bloodstained streets. Today a shrine to the 417 Gee Hin fighters who fell that night still stands in Kathu,” he added. The meticulously researched and colourfully written book deserves a place on every Phuket resident’s bookshelf for its fascinating stories of the island’s long, multi-faceted, and often bloodsoaked and ruthless, past. The second edition costs B1,000 and is available in several outlets in Phuket, including Seng Ho Books. Or simply visit the website: historyofphuket.com for a full list of outlets or to buy a copy of the book, which will be mailed to your address. An ebook, in epub format, is also available for B700 through the website.